Stoneham Theatre will present "What Are You Doing New Year's Eve?" starring Kathy St. George on Friday, December 31, at 7 and 10 p.m. Tickets for each performance include a champagne toast. A Stoneham Theatre favorite, St. George will ring in the New Year singing favorite show tunes and Great American Songbook hits. 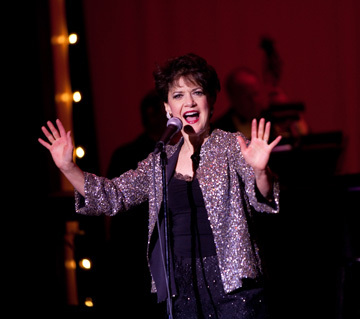 Accompanied by a seven-piece band, she will also include several Judy Garland numbers, including the classic sketch "The Wizard of Oz in Ten Minutes" which was last seen in St. George’s sensational one woman show "Dear Miss Garland" staged at Stoneham Theatre in the Summer of 2009. St. George has been seen at Stoneham Theatre in such productions as" Dear Miss Garland," "Pete N' Keely" and "A Christmas Carol." She is currently performing in the Theatre’s holiday production of "The Best Christmas Pageant Ever." On Broadway, she has performed in "Fiddler on the Roof," directed by Jerome Robbins. She has also been seen in "I Love You, You're Perfect, Now Change" (including with five national tours), "Menopause the Musical," "Respect," "Nine," "Shear Madness," "Blithe Spirit," "Ruthless!," and in the title role of "Peter Pan." A two-time IRNE Award recipient for "Das Barbecu" and "And Now Ladies and Gentlemen, Miss Judy Garland," St. George is a Stoneham native. The Theatre also recently announced The Great Match, a generous $100,000 pledge from Stoneham Bank, which will be secured if Stoneham Theatre can raise $75,000 on its own by December 31. For more information, visit www.stonehamtheatre.org/TheGreatMatch.html. For tickets and information for the New Year's Eve show, stop by the box office at 395 Main Street, call 781-279-2200 or visit www.stonehamtheatre.org.